What Drone Or Traitor Will Rid Us Of This Turbulent Colonel? Starting tomorrow, the UN will provide regular air service connecting Malta, Cairo and Benghazi. I take that as a big indicator that the division of Libya into an eastern rebel-held territory, and a western regime-controlled state, is setting in for the long term. An academic specialist in Libyan history has sketched out four scenarios for how the current stalemate might be resolved. None of them sound good. The first involves a more intense support for the ability of the rebels, aided by NATO power, to steadily move westward and unify the country by overpowering the province of Tripolitania and replacing the Gaddafi regime. In light of the checkered history (of very long standing) between Tripolitania and Cyrenaica (where the rebel movement is now located), this scenario would open old wounds. When the Kingdom of Libya was created in 1951, Tripolitania resentfully agreed to be pushed together by the Great Powers into a single political entity ruled by a monarchy with its roots in Cyrenaica. The resentment within Tripolitania, where support for Gaddafi has traditionally been the strongest, would be enormous if once more a government were foisted upon it either by a Cyrenaican-led rebel movement or through the support of the international community—a likely possibility under this scenario. A second scenario would be to simply allow Libya to separate into two smaller states, focused around Tripolitania in the west and Cyrenaica in the east. This would, however, leave Gaddafi in control of part of the country—obviously not an ideal solution in light of the possibilities it would afford him to attempt the subversion and destabilization of Cyrenaica, or to engage in a number of similarly destabilizing ventures in the region and beyond. In addition, this scenario would require a commitment from the international coalition to protect Cyrenaica—certainly not a prospect either the United States or the European Union would be enamored of. A third possible scenario involves a somewhat patient process of gradually undermining the credibility and prospects of the Gaddafi regime over time. This means systematically undercutting the regime’s traditional methods of using patronage for its survival as international sanctions take hold and Gaddafi’s financial resources are depleted, and hoping that eventually internal desertions and perhaps a palace coup would take place within the inner circles of the regime. The final scenario is one that may prove the least attractive for many Libyans, but more attractive to the many parties now involved in the conflict. It is perhaps also the most promising for the future of the country, and would certainly minimize the dislocations and potential infighting some of the other scenarios entail. It consists essentially of a diplomatic compromise whereby Gaddafi (and his family and closest confidants) would depart into exile. The range of countries willing to accept this sordid entourage would be tiny, made even smaller by the fact that the Libyan leader would undoubtedly try to find asylum in a country that does not recognize the authority of the International Criminal Court. The two most likely scenarios - i.e., the rebels win and bring on a Cyrenaican rule over the Tripolitanian vanquished, or the two parts of Libya stay divided with the international community inevitably seen as backing the Cyrenaican half - both lead to long-term conflict. The last scenario - Qaddafi chooses to go into graceful retirement and everyone lets him - is impossible to imagine. That leaves us hoping the international community can increase pressure on the regime until the next Colonel or Captain launches a coup, and Qaddafi is removed from office via the 9mm referendum. It is a dismal situation when that is the best outcome we can expect. Nevertheless, that appears to be what NATO and US officials are trying to bring about, directly or indirectly. According to Defense Secretary Gates this week, "we are not targeting him specifically, but" we are bombing all the structures and bunkers where Qaddafi might be present, and obviously we would be very relieved if he happened to be inside one of them when it is destroyed. A bonus, as it were. Or, an ambitious character within his trusted circle could whack him out. Either way, Qaddafi is removed but the rebels didn't do it, leaving the possibility of a political reconciliation between the eastern and western halves of Libya. Defense Secretary Robert M. Gates stood on the steps of the Pentagon late Tuesday alongside Liam Fox, his counterpart from Britain, America’s closest ally. Questions swirled here, in Europe and across North Africa whether NATO was specifically trying to find and kill Col. Muammar el-Qaddafi, the Libyan leader, with airstrikes. Mr. Gates patiently repeated the alliance’s longstanding policy that it was attacking only legitimate military targets in Libya in order to degrade the ability of the government’s forces to threaten its civilian population. There was no targeted assassination effort under way. “We have considered all along command-and-control centers to be a legitimate target, and we have taken those out elsewhere,” Mr. Gates said. That careful, diplomatic language from the defense secretary came as administration officials and NATO officers in Europe confirmed that the alliance plans to step up attacks on the palaces, headquarters and communications centers that Colonel Qaddafi uses to maintain his grip on power. Let's be blunt and just state that we are going after him, and not just his palaces, HQs and command posts. By not saying that in so many words, we are in the insincere position of a modern day King Henry II, wondering aloud "who will rid me of this turbulent priest?" and then playing innocent when someone takes us up on that. Of course, by "drones" he wasn't referring to unmanned aerial vehicles. Still, that's a nice coincidence. We are depending on exactly those same things today to rid us of Qaddafi. 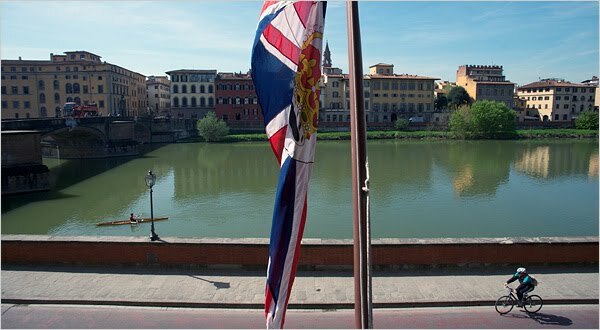 Austerity measures and global diplomatic realignment have trumped literary romanticism, it seems, and the British Foreign and Colonial Office has decided to close its consulate in Florence. The New York Times has a nice article on this sorta-kinda historic happening. But if you, like me, refuse to comply with the NYT's new paywall, you are out of luck. OR ELSE you can go to the NYT World Edition, which for some reason is still available free online, the way God intended information to be. FLORENCE, Italy — It has seen the rise of the Grand Tour and the package tour, the romance of E. M. Forster’s “Room With a View” and the tensions of two world wars. And now, after five centuries, the British Consulate in Florence is closing its doors, a victim of budget cuts and the currents of history. Once a haven for traveling aristocrats and dreamy Britons escaping the strictures of home for the looser ways of Italy, in recent years the consulate has dealt more with lost passports than lost morals. But it holds a central place in the history of British-Italian relations, and news of its closing has been taken as an affront here. The mayor of Florence has expressed regrets, one Florentine aristocrat says she hopes to raise the issue at the royal wedding, and a leading British historian here has questioned Britain’s diplomatic priorities. 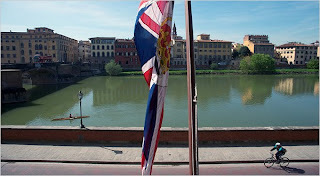 As the sun streamed through the windows of his office overlooking the Arno River on a recent morning, David Broomfield, the man who will most likely be the last British consul of Florence, treated the news wistfully. “It’s not like I’m the last governor leaving the old colony with a feather in his hat,” Mr. Broomfield said. “But it’s the end of an important tradition here for 500 years.” There was an English diplomatic presence in Florence as far back as the 1450s. Across the room, lists of his predecessors hung framed on the wall in neat calligraphy. They begin in 1698 with Sir Lambert Blackwell, “consul at Leghorn,” as the port city of Livorno was then known, and continue through Sir Horace Mann, who as consul in Florence from 1760 to 1786 turned the consulate into a salon, receiving all Britons of rank who passed through the city. On one panel, a line of devastating understatement reads, “No British representation in Florence 11 June 1940 to 1 Feb. 1945.” Every year, the city holds a memorial service for the first British soldier killed in the Allied liberation of Florence. Indeed, since 2007, the Foreign Office has opened consulates in Goma, Democratic Republic of Congo; Antananarivo, Madagascar; and Juba, Sudan; and closed them in Durban, South Africa; Geneva; Kaohsiung, Taiwan; Nagoya, Japan; and Aleppo, Syria; among other places. Britain is also closing its consulate in Venice, meaning that Britons who need help or lose passports will have to travel to Rome, Milan or Naples for assistance. Maintaining five consulates in Italy is obviously not in the cards for a nation undergoing severe economic contractions. Which makes me wonder all over again why the U.S. maintains some embassies and consulates in places of little importance to us, such as Burmuda. They would seem to be prime candidates for the budget chopping block. The Pentagon this month put out a rush order solicitation, spotted by our colleague Walter Pincus, for “27,500 ballistic undergarments” for $2 million, noting that “ballistic underwear is currently being used by British forces” in Afghanistan “and they have significantly less injuries” to their privates as a result. I'm sure their Corporals, Sergeants, and Other Ranks have benefited as well. Monday's break-out of Taliban prisoners from Kandahar’s main prison was "a blow to Afghan and American efforts to secure and modernize the Sarposa prison, which stands adjacent to a new U.S.-funded “rule of law” center to process prosecutions," according to the WaPo. I'll say it was. There ought to be plenty of egg on lots of faces. The only thing that could make it worse would be if we found out USAID indirectly funded the construction of the tunnel. That's not as improbable as it might seem. The tunneling began in a construction compound outside the prison, and the tunnelers needed serious tools for digging, materials to brace up the tunnel, trucks to dispose of the excavated dirt, instruments to track the position and guide the direction of the tunnel so that it came up inside a cell in the political section of the prison, etc. What are the odds that those industrious Talibs acquired at least some of that equipment and expertise from the many U.S.-funded construction jobs that were going on all around them during the four or five months they were working? I'd say pretty good. But the metal and concrete beams made there were not for building US-sponsored projects. Instead they were used to support a part of the tunnel that went directly underneath a section of Afghanistan’s most important road: the stretch of Highway One running between the cities of Kandahar and Herat. According to one of the escapees (whose numbers could dramatically tip the odds in favour of the insurgents on the eve of this year’s “fighting season”), the tunnel was of sufficient diameter and high enough for the prisoners to stand upright for most of their walk to freedom. Sections were lit by electric light and ventilated with fans, he said. In the Middle East and Central Asia, when suspected militants go to jail, they don't necessarily stay there. 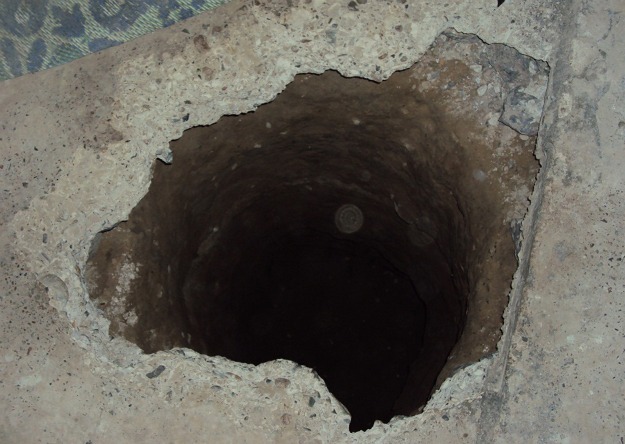 This was very much in evidence this week when the Taliban built 1,000 feet of underground tunnels (shown above) to free nearly half the prisoners at the Sarposa prison in Kandahar. It was a brazen feat to be sure, though not even the largest break in the history of that prison. That honor goes to the 2009 Taliban raid that freed nearly 1,200 prisoners from Sarposa, including 350 Taliban members. That break involved two truck bombs crashing into the front gates followed a group of fighters armed with RGPs and automatic rifles. Security upgrades were made after the attack and an American military officer told reporters just this year that the only way to break in would be would be to “put a nuke on a motorcycle.” Or, you know, build a really long tunnel -- a method that was a pop culture cliché by 1963. Foreign Policy's blog has an entertaining look back at some of the Great Prison Breaks of the War on Terror today. Read about them here. I look forward to teaching a media and national security policy course next academic year @DickinsonCol, @PennStateLaw and @ArmyWarCollege. President Barack Obama is likely to nominate veteran diplomat Ryan Crocker as the next U.S. ambassador to Afghanistan, a source familiar with the pending appointment said on Tuesday. The move would pair Crocker again with General David Petraeus, the U.S. commander in Afghanistan who had served in Iraq at the same time as Crocker. The diplomatic heft Crocker may be able to bring to the post and his experience running the civilian side of a war alongside Petraeus could help Obama cement recent military gains ahead of the planned withdrawal. But bringing back the duo that helped salvage former President George W. Bush's political fortunes in Iraq also risks making Obama look desperate or lacking new ideas for the war he said was more important than Iraq. Syria: The New Romania, Or The New China? Troops are firing on civilians, and the scene is quite horrible. But I fear that he and other believers in the political uses of new media are going to be disappointed if they think that drawing attention to atrocities via Twitter and Facebook will make a difference. Call me a cynic, and I will be delighted if events prove me wrong, but I don't see how tweeting about Bashar's crimes will do anything to hold him accountable. We have been in "an era of technology" for quite some time now - it even predates the internet! - but dictators have gotten away with murder all along. I don't know what a thousand tweets could have added to the impact of that single 'old media' report. Everybody saw the Tiananmen Square massacre happen, everybody was shocked, but nothing happened to the Chinese leadership as a result. International Court of Justice? Not interested. An embargo on international trade and economic development assistance? You must be kidding. Diplomatic consequences? Mere hand wringing, and not even much of that. If Chinese relations with the rest of the world suffered in any way, I can't see how. Certainly the U.S. is very friendly with China today. Two months later, when the State Department assessed the aftermath of the China crisis, it was clear that there would be no lasting consequences either internally or externally. The current 'Arab Spring' is analogous to the wave of uprisings that passed through Communist states in 1989, and this naturally excites the imagination of well-wishers. But the uprisings of 1989 ended when they hit the wall of a regime confident enough to use whatever force was necessary to maintain its authority and let world opinion make of that what it will. Maybe Bashar Assad and his lovely wife Asma will turn out to the next Nicolae and Elena Ceausescu. That would be okay by me, but I don't think tweeting will make that happen. 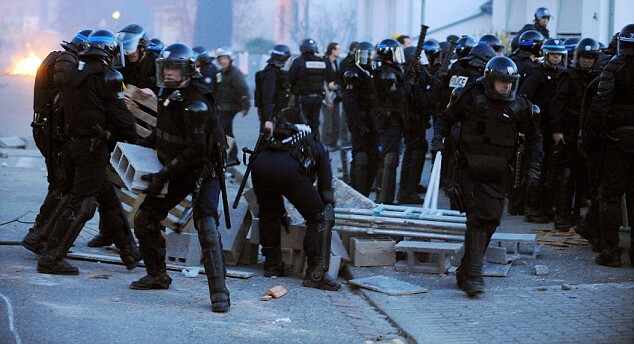 The French paramilitary riot police are famous for their hard-line tactics. They're a tough bunch, and they get called out almost constantly to put down everything from student demonstrations to industrial strikes to Muslim immigrant uprisings and holiday carbeques. It sounds like thirsty work. And indeed, the riot cops traditionally enjoy a glass of wine or beer with their meals, including meals consumed while on duty. It's a traditional French cultural practice to allow wine or beer with meals even in job settings where we Anglo-Saxons would prohibit it on grounds of safety. This can be jarring; I once shared a meal of pasta and wine with French pilots in the business class lounge of the airport in Doula, Cameroon, right before they flew me to Bangui. But now the nanny state has interfered with this free expression of Frenchness. 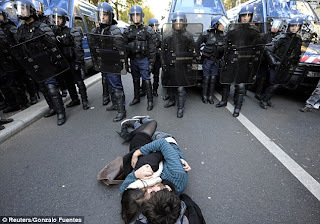 And the riot cops are threatening to strike in protest. What's the French word for irony? While British police are strictly barred from drinking on duty, the French have traditionally been allowed 25cl of wine or a small beer with their main meal of the day. It was normally served on an official tray and sometimes eaten in full view of the public, often outside riot-control vans. "Our right to drink alcohol with our food is protected by the law and our members are very unhappy at being treated like children," Mr Mangione added. The CRS, which was formed after the Second World War to "protect" the Republic from internal threats, has always been renowned for employing particularly tough officers. 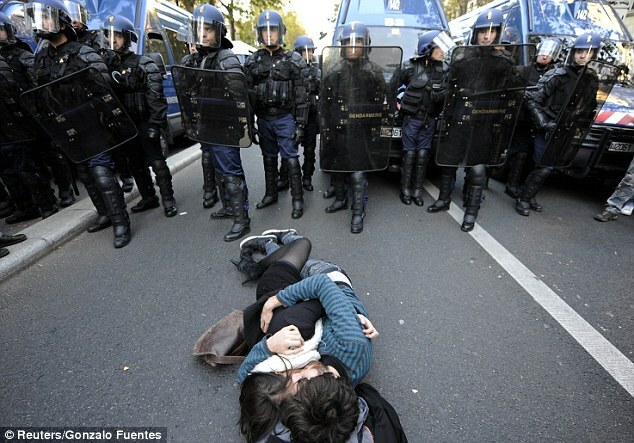 They are often seen bracing themselves for action on the streets of major cities like Paris, Marseilles and Lyon. Whenever a riot is threatened in a housing project or outside a university, it is invariably the CRS who are called to mobilise. Their tactics involve responding swiftly, and often violently. Mr Mangione said he would be making a formal appeal against the new rules to the police authority. A spokesman for the CRS central directorate said they had no plans to reconsider their decision. I say, good for them. What would a Frenchman be without his wine? Little better than a foreigner. And besides, who will the authorities send to enforce their order against the CRS? Quis custodiet ipsos custodes? Which is Latin for "who will beat up the riot cops?" I'm shaking my head ruefully. Ruefully, I tell you. Two great big official U.S. Government secrets were made public yesterday, one of which mattered and one of which didn't. What makes me shake my head is that the one that mattered was exposed through carelessness, while the inconsequential one was released only after decades of fierce resistance to repeated Freedom of Information Act requests and appeals. The documents – dating from 1917 and 1918 – described World War 1 “secret ink” recipes and instructions on how to open sealed letters covertly. Will the Republic survive now that this bit of espionage tradecraft has been compromised? I pray that it will. But I'll give the CIA credit, security-wise, for not giving up even that extraordinarily insignificant bit of info without a long hard fight. The fight was pointless and ill-advised, but nevertheless, they kept those secret formulas secret, and the nation was protected against the Kaiser and his Huns all the way from the Woodrow Wilson administration up until yesterday. Now for the important secret. Someone posted sensitive security-related building design information on a publicly accessible website of the Army Corps of Engineers, revealing, among other things, how much bomb blast certain types of domestic U.S. Government office buildings are built to resist. The info had been on the site for some time, possibly since 2009, before the press noticed it and notified the ACE. The fact that newly constructed government buildings are built to resist bomb blast is not, in itself, a secret. But the actual bomb charge weight (the "design basis threat") used is a secret, and its release could be helpful to would-be terrorists. In what officials admit is a major breach of security, a document describing design features intended to make a new Defense Department building bomb-resistant has been posted on a public government website. The document, comprising a 30-page narrative and hundreds of pages of technical data, describes bomb-proofing features which were incorporated in the structural design of the Mark Center, a new office complex in Alexandria, Virginia, Defense Department personnel are scheduled to move into the building later this year. One of the document's key points is raising eyebrows among some experts -- the building's level of bomb resistance. According to the paper, the Mark Center is designed to resist threats posed by vehicle bombs detonated outside the building's security perimeter carrying the equivalent of 220 pounds (100 kg) of TNT. That is far less than the amount of explosive used in recent attacks in the United States, including the 1993 bombing of New York's World Trade Center and 1995 bombing of the Alfred Murrah Federal building in Oklahoma City. Michael Greenberger, a former Justice Department lawyer who heads a Homeland Security institute at the University of Maryland, said the document is a "recipe for an attack. It should not be on the Internet." The document would allow potential attackers to examine the building's bomb-proofing features to pinpoint weaknesses, according to Tom Thurman, a former FBI bomb disposal expert who now teaches security and emergency management at Eastern Kentucky University. "If you know what all the defenses are, you plan the attack around those defenses," he said. The public posting of such a document is "inexcusable," he said, adding: "It's not something that should be on any unsecure government website whatsoever." The assessment said the building is designed to resist vehicle bombs carrying 220 pounds (100 kg) of TNT equivalent from outside the facility's security perimeter or a bomb of about 55 pounds (25 kg) of TNT-like material in a vehicle that gets inside the security zone. Many bomb attacks involved much larger quantities of explosives. An official report by the Federal Emergency Management Agency noted that the Oklahoma City bomb blast "was equivalent to the detonation of approximately 4,000 pounds (1,818 kg) of TNT." A report posted on the website of the New York Police Department says that the vehicle bomb used to attack the World Trade Center in 1993 had the explosive power of 900 pounds (409 kg) of TNT, while the bomb used to blow up the U.S. Marine Barracks in Lebanon in 1983 had the power of 12,000 pounds (5,454 kg) of TNT. Joanne Hensley, the Army Corps' deputy project manager for the building, said the decision to base the building's bomb-proofing design elements on the threat posed by a 220-pound bomb was a "judgment call by our experts." While this leak does do some damage, and it should never have happened, and I'm surprised that the Defense Department considered the blast design basis threat merely FOUO rather than classify it at a higher level, still, I do not think the sky is going to fall because the 220 pounds figure slipped out. First, a building's setback distance, that space between the bomb and the building, is all-important. A building with setback will withstand damage from a bomb blast much, much, better than one without. The Oklahoma City Federal Building had no setback at all, and the World Trade Center had less than zero setback since it allowed visitor's vehicles into an underground parking garage. So those examples are really not pertinent. Second, the sizes of the OKC and NYC bombs were much larger than the typical or most frequently seen vehicle bomb, either in the U.S. or overseas. Reliable data on terrorist vehicle bomb sizes is hard to obtain - I don't mean that it's particularly classified, just that hardly anyone collects it - but my own research indicates that the median size of all vehicle-borne bombs that have been used around the world going back more than two decades is right around 200 or so pounds. And lastly, just because the design criteria cited 220 pounds does not mean the building would collapse under 221 pounds. Buildings have multiple architectural and structural requirements, including non security-related ones, that will result in a considerable margin of error. So I agree with Ms. Hensley, the Corps' deputy project manager. They can't protect every target against the largest vehicle bomb ever built, and they must seek a reasonable level of protection commensurate with the threat. I just wish the Corps would show one tenth of the CIA's tenacity when it comes to holding on to its secrets. P.S. - What about our much-maligned Fortress Embassies? How big a bomb can they resist? Is that also 220 pounds? The Department of State [building security] criteria ... are controlled information, [however] their approach is to enforce both an anti-ram and anti-personnel standoff distance, provide a debris mitigating and forced entry ballistic resistant (FEBR) façade, provide a regular moment resisting frame that is inherently resistant to progressive collapse and to design the structure to resist the blast induced base shears. Both the magnitudes of the design basis threats (DBT) and the performance criteria for the DoS Buildings are generally much more arduous than the corresponding requirements imposed by either the ISC or UFC Criteria [which govern domestic government buildings]. So don't worry. We're "much more arduous" than our domestic counterparts when it comes to this bomb blast stuff. Who among us has not wanted to go "just a little bit rogue" now and then? Politico has an interview with former State Department Spokesman Phillip Crowley in which he explains his reasons for going on the record with remarks that he knew would infuriate the Pentagon and the White House. Basically, he believed it was his job to advance a 'strategic narrative' on U.S. policy, rather than merely to answer questions from the press. When [Philippa Thomas, a BBC reporter on leave as a Nieman fellow at Harvard University] reported Crowley’s statement [characterizing Wikileaks suspect Bradley Manning’s treatment by the Pentagon as “ridiculous, counterproductive and stupid”], some of his friends thought he’d acted on the flack’s equivalent of a Freudian death wish, spontaneously combusting in the lab at the Massachusetts Institute of Technology. His critics in government, who’d long regarded him as too aggressive, even undisciplined, to speak from the State Department podium, viewed the statement as his latest gaffe. To Crowley, it was neither. It was just the latest step in his characteristically low-key decision to go just a little bit rogue, the latest step in a career spokesman’s realization that words can have real power. “When I paused and then agreed to have the remark on the record, I knew there was a dart that I was sending to the Pentagon,” he said in a recent interview in the deserted bar of a Washington hotel. But unbeknown to his new colleagues at State - and many of his old friends across Washington - Crowley arrived at State after an evolution of sorts. The career Air Force officer, who had entered a military establishment still scarred by the Vietnam War and still deeply hostile to the press, spent his years in civilian life at the Center for American Progress, thinking about strategy. There, some colleagues were surprised to find that his politics seemed to have been shaped more, as one put it, by his native Massachusetts than the Air Force. He settled on the idea of “strategic narrative,” a concept that has made its way into national security jargon from business theory, and one he included in a report he wrote for CAP. At the State Department podium, Crowley seemed to find his voice and to also realize that his voice could shape policy. Behind the scenes at the State Department, he’d often argued for blunter, less diplomatic talk. And he’d at times angered the White House and his colleagues by straying dramatically from his official guidance, and positioning himself not just as a staid briefer but as a combatant on the global stage. To the Obama Administration’s careful national security team, these and other Crowley comments were sloppy and infuriating. To Crowley, it was deliberate strategy in a job that has, as he sees it, an institutional role beyond the demands of day-to-day politics. I can't criticize VP Biden for snoozing a bit during that speech, but what's up with the person behind him? She's nodding out like an addict at a Methadone clinic. In fairness to Biden and his narcoleptic neighbor, the budget plan was really nothing to stay awake for. After the speech, the White House sent out this chart of its four-step "Comprehensive and Balanced Framework to Reduce the Deficit and Win the Future." All that in only four steps? It would be impressive except that the steps are made mostly out of vaporous strings of buzzwords that evaporate when you look at them. Such as Step 2, on Security Spending Cuts. The plan is to "Hold growth in base security spending below inflation while further improving efficiency and effectiveness ... Ensure our capacity to meet our national security responsibilities." All I can see there is that we will not actually reduce either our spending or our responsibilities. If there is any other meaning in Step 2, it disappears into the mists of Pentagon "efficiency and effectiveness." Putting out a multi-step plan that lacks implementing details just draws attention to the administration's already pronounced Underpants Gnome syndrome. The Broadcasting Board of Governors will receive $10 million under the compromise spending deal reached last week. President Obama effectively sided with the BBG over his own State Department in a funding dispute involving Internet circumvention work. Obama and lawmakers agreed to language in the fiscal 2011 spending bill cutting the State Department’s share and giving the BBG a portion to “expand unrestricted access to information on the Internet.” The BBG operates five government-sponsored international broadcasting networks. As a result of the deal, which still must be approved by Congress, the BBG is guaranteed $10 million for its anti-censorship work in China and other repressive regimes. Such efforts, for example, will allow Chinese citizens to circumvent the country’s firewall to access Voice of America on the Internet. It's good news for Chinese hacktivists, but how odd that it had to come to this. The President unable to budge one of his own cabinet members? What Part Of "Spend The Money" Didn't You Understand? The State Department has been curiously slow to start spending $$ on internet freedom initiatives. Humm. Evidently, this is one budget line item that Congress thinks is really essential. Could get interesting. Last month, Citizens Against Government Waste named Senate Harry Reid its Porker of the Month "for his absurd belief that a federally-funded Cowboy Poetry Festival in Elko, Nevada (pop. 17,000) constitutes essential government spending." Today, the New York Times has a story about how Reid shot himself in the foot by bringing up his idiosyncratic pet cultural project during the budget debate. I mean, the idea of cowboy poets is funny enough all by itself. But the cherry on top is that these sensitive souls in the sagebrush have been getting government grants to produce their celebrations of rugged individualism on the frontier. ELKO, Nev. — This isolated town in the northeast Nevada mountains is known for gold mines, ranches, casinos, bordellos and J. M. Capriola, a destination store with two floors of saddles, boots, spurs and chaps. It is also the birthplace of the annual Cowboy Poetry Gathering, a celebration of range song and poetry that draws thousands of cowboys and their fans every January and receives some money from the federal government. By every account, Mr. Reid is an admirer of what takes place here. He grew up in small-town Nevada, is a fan of cowboy culture and has boasted in news releases of getting money for the Western Folklife Center, which sponsors the event. His mention of the gathering, as an example of what he views as valuable projects financed by the National Endowment for the Humanities and the National Endowment for the Arts, appears to be an innocent — if unfortunate — political misstep by a leader who is known for occasional political missteps. In most years, the government provided about $45,000 to the Western Folklife Center; the conference costs about $650,000 to $700,000, with two-thirds of the money coming from ticket sales. The N.E.A. provided seed money in the early 1980s that allowed researchers to gather oral histories from aging practitioners of what was than seen as a dying art, and to finance what turned out to be the first cowboy poetry gathering. in the crossfire, or before investing more on war. If Mr. Reid has succeeded in bringing to light a fascinating aspect of Western culture that is not known to many Americans, it came at a price. To answer Mr. Dofflemyer: Yes, that is indeed the sort of thing I would rather my tax money went for. That, and other types of essential spending, or at least, non-elective spending. And, by the way, I hope that verse he produced in defense of Harry Reid isn't typical of what we've been subsidizing all these years. Is Reid the "little girl lost in the crossfire"? That kind of thing is not good enough for government work. If Mr. Dofflemyer is our nation's Cowboy Poet Laureate Lariat, I want my money back. and all across the lonesome prairie. Git along, my little subsidies! Head ‘em up, ride ‘em in, cut ‘em out. Count ‘em up, cash ‘em in, pay ‘em out. I like that one better than Dofflemyer's. If NEH wasn't losing its cowboy poetry funding, I'd send it in and see if I could get some small financial contribution. Hey, Chinese Dylan fans, I feel your pain about how your cruel communist overlords censored that Shanghai concert. So here's a little internet freedom for you. The original, acoustic, practically mumble-free Bob Dylan, from the 1964 Newport Folk Festival. And he sings the whole four verses of Mr. Tambourine Man, not just the one-verse version made familiar by The Byrds for a short attention span mass market. Just in case I'm wrong about the "practically mumble-free" part, you can read the lyrics here. So what was different this year? This year, Mr. Tambourine Man caved and submitted to censorship. His boot heels won't be wandering to a less culturally repressive marketplace. 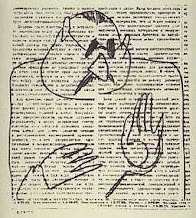 Personally, how silly is it that the Cultural Bureau felt the need to censor him in the first place? Even people who understand English have trouble making out what he's saying, not to mention Dylan is so unknown here that Xinmin ran a story about his upcoming concerts with a photo of country crooner Willie Nelson instead. They mistook the Redneck Dalai Lama for Dylan? In fairness to Xinmin, I guess round-eye 60s' leftovers do all look alike. But back to Dylan. Is he embarrassed? No. As he says these days, "I used to care but things have changed." Yea, the budget battle is over! Um, actually, no. The deal that was cut on Friday was merely for another stopgap spending measure. The 2012 budget is a whole other bill, and a much bigger battle, yet to come. But even that is still far down the road. The next battle will be over raising the debt ceiling, and that one will be really intense. To see how high that debt ceiling already is, look at the U.S. Debt Clock. WASHINGTON — The down-to-the-wire partisan struggle over cuts to this year’s federal budget has intensified concern in Washington, on Wall Street and among economists about the more consequential clash coming over increasing the government’s borrowing limit. The United States is one of the few nations that limits its debt by law, and votes in Congress to raise the ceiling, something that happens every few years, are perhaps the least popular that lawmakers face. What makes this year different, people in both parties say, is the large number of Congressional Republicans, including the many newcomers who gave the party a House majority, who are strenuously opposed to government spending, and egged on by the activist Tea Party movement to use the leverage of the debt-limit vote to make their stand. Neither the White House nor Congressional leaders are certain how they will get enough votes to raise the limit. The White House and Democrats in Congress will urge passage of a “clean” debt limit increase, without amendments, though they acknowledge that cannot pass in the Republican-controlled House. While the House is the focus of most concern, passage in the Democratic-controlled Senate will be a challenge as well. Republican conservatives there, reinforced by Tea Party adherents elected last November, vow to filibuster any increase in the debt limit, which would require a 60-vote supermajority to overcome. After this week, Congress recesses until early May, returning just two weeks before Treasury hits the debt ceiling. Even stretching the deadline for action to July, there would be little time to reach a debt-reduction accord. There are so many angles to this one that it would take a Chess Grandmaster to predict even the opening moves. The Great Debt Ceiling Battle of June 2011 will make for great political theater, but the brinkmanship we can expect from both sides will get hard on the nerves of those who depend on government paychecks. My advice? The world always needs summer school teachers. Maybe it’s my 20 years as a labor lawyer, having gone through dozen and dozens of collective bargaining negotiating sessions, but I’m amazed at how little the press and activists on both sides understand what is going on. In order to get the best deal for his side, [Speaker Boehner] has to convince both his own side and the other side that there is no more room to spare. So, first you let the clock run down toward midnight. The media hysteria helps Boehner in this regard. Then — and this is important — it can not come down to a single issue. A savvy negotiator needs two. Oh, and look — Boehner has two. He has the riders and he has the amount of cuts. If the Democrats really can’t abide by the riders, they have to agree to more cuts. If they can’t go any higher on cuts, they need to fork over something on riders. This is rudimentary negotiation strategy. And sure enough (as I wrote this morning) Boehner is going to get his way today, passing a week extension and funding for the Defense Department through the end of FY 2011. No way that doesn’t get passed by the Senate and signed by the president. And in a few days (maybe less) there will be a deal on the rest. And rest assured, Boehner will have squeezed the Dems as hard as possible. You’ll know because he will get either more than $33 billion in cuts or something on the riders. Could be hopeful. Boehner does, indeed, come from a business executive background, so this makes sense. As the Zen Master said of the little boy who got a pony, "we'll see." The U.S. Department of State has authorized a reward of up to $5 million for information leading to the location of Mohammad Ilyas Kashmiri. 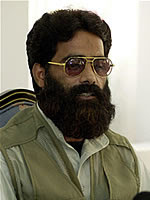 Kashmiri is the commander of the terrorist organization Harakat-ul-Jihad al-Islami (HUJI), which supports al-Qaida. Since 2001, he has led HUJI training camps and his organization has launched several attacks in India and Pakistan. On March 2, 2006, HUJI launched a suicide bombing against the U.S. Consulate in Karachi, Pakistan, which killed four people, including U.S. diplomat David Foy, and injured 48 others. It's the least we can do for the perpetrator of an attack that killed one of our citizens, one of our local employees, and a Pakistani soldier posted to our consulate. White House Issues Af/Pak Situation Report; Best Described As "Grim"
The Obama administration yesterday submitted its twice-annual report [here] on the situation in Afghanistan and Pakistan to Congress, grimly stating that there is "no clear path toward defeating the insurgency in Pakistan, despite the unprecedented and sustained deployment of over 147,000 [Pakistani] forces" (McClatchy, Post, Reuters, FT, BBC). The report expressed concern about Pakistan's failure to sustain counterinsurgency operations against militants in the country's northwest, noting that Pakistani forces have had to conduct three major operations in Mohmand agency in the last two years, though the unclassified report made no explicit calls for further operations, especially in troubled North Waziristan (WSJ, AFP). The report also called Pakistan's worsening economic situation "the greatest threat to Pakistan's stability over the medium term" (NYT). Public Diplomacy, Internet Freedom, And "Where's Jared?" Anne Applebaum, in the WaPo today, asks whether the State Department has run into a firewall on internet freedom. Some of the “tools” she mentioned, such as software that enables individuals to evade regime firewalls without detection, were already in use. The money was there, too: Three months earlier, in October 2009, the State Department had received $30 million from Congress specifically to combat Internet censorship. Yet in the subsequent year and half, none of that money was spent — not in Libya, not in China, not anywhere. As it also happens, another U.S. government agency, the Broadcasting Board of Governors, has deployed these two companies’ [anti-censorship] programs with notable success ... The BBG can track its success: At first, it noted an uptick in access in Iran, China and Vietnam (where there are now some 80,000 users). More recently, Ultrareach recorded a 700 percent jump in use in Tunisia between Dec. 17, when a desperate fruit vendor set himself on fire, and Jan. 12, the day President Zine el-Abidine Ben Ali officially ended Internet censorship in Tunisia. It tracked a 6,125 percent increase in use of its services in Egypt from Jan. 21 to 27. What an odd situation. A government agency that (1) has a mission, (2) has funds to spend on that mission, and (3) has effective tools with which to accomplish that mission, but (4) won't spend the money it has to use the tools it has? There must be some reason for this odd inactivity. Perhaps we're thinking that activists in totalitarian countries need more in the way of risk management than just a tech-tool? Or did WikiLeaks give us second thoughts about the desirability of "a single Internet where all of humanity has equal access to knowledge and ideas”? Is it that we are reluctant to offend the ChiComs? And most of all, why can’t my hero @JaredCohen do something about this? Or rather, why can't he "think/do" something? And what exactly has he thought/done so far in that Google think/do tank? I will be disillusioned if he turns out to be the sort of character who is perpetually on the verge of creating the next big thing. Seating is limited, so hurry. This is a once in a lifetime opportunity to pick up Jimmy Carter memorabilia. I wonder if they'll auction off the sledgehammer he used to beat on the economy with? Today, the Obama administration announced that it will prosecute the suspects accused of planning the 9/11 attacks in the Guantánamo military commissions system. This is a reversal from Attorney General Eric Holder's November 2009 announcement that the 9/11 defendants would be prosecuted in federal courts. The ACLU has invested a lot of effort in closing GITMO on Obama's watch, and they must be feeling politically whip-lashed today. Personally, I feel no grief whatsoever at the final collapse of that particular campaign promise. A new Reuters story from Kabul has significant details about Friday's mob attack on the UN mission compound in Mazar-i-Sharif. Apparently the compound was weak on physical security, which surprises me. An angry mob that killed seven foreign UN staff in north Afghanistan ripped out the door of a bunker where several had taken shelter, and slit the throat of one man who survived a bullet, the top UN envoy in the country said on Saturday. Staffan de Mistura promised that the United Nations would stay in Afghanistan after the vicious assault, the deadliest it has faced in Afghanistan, but would have to reconsider security, particularly guarantees from Afghan forces. Afghan police were the first line of protection on Friday when a crowd of up to 3,000 demonstrators enraged by the burning of a Koran by a militant fundamentalist Christian in the United States overran the compound, killing seven staff. De Mistura said the violence, in a normally peaceful city, had caught ill-prepared Afghan police by surprise, and the gurkhas who are the next layer of security for the United Nations could not open fire because they are forbidden to shoot into crowds that contain civilians. "Its clear if the Afghan police had a cordon of separation between the demonstration and the building, the building would not have been attacked," he said. "The reality is that our gurkhas are never going to shoot at civilians, so the demonstration became an entry point, making it gradually impossible for our own gurkhas, our own security to intervene." In other words, the UN Mission relied on the presence of local police and their own (third country national) armed guards to deter mobs. They evidently did not put up the kinds of physical barriers - high perimeter walls and gates, entry control facilities, protected guard booths and police fighting position, etc., - that would have delayed and channeled the mob, and made it more feasible for the armed presence to prevent anyone from entering. Without that element of physical delay, guards and police can't be fully effective. As de Mistura correctly noted, the Gurkhas would not simply fire into a crowd of 3,000 persons. And it wouldn't have been effective even if they had. However, they would have fired at specific persons climbing over a wall or breaching an entry control point. Inside the UN compound, the headquarters building likewise lacked physical security relevant to a mob attack. The four [internationally engaged employees] who were in the compound fled into the bunker when they heard the walls had been breached, but it had been built to withstand shrapnel from a bomb blast, not a sustained assault. "The bunker is made for sustaining attacks by bombs, suicide bombers, not by a crowd of people with hammers or whatever they could find, so they were able to enter the door," de Mistura said. That is an astute remark by de Mistura. While most people will assume that any wall, door, or window that was built to resist bomb blast will also resist small arms fire and forced entry, that is not at all the case. In order to protect people against a prolonged mob attack that uses small arms and improvised hand tools ("hammers or whatever they could find") you need products that were specifically designed for that purpose, like the ones that U.S. embassies use. FYI, for a detailed description of how those embassy products are tested, and I do mean detailed, see this article in an old issue of a construction trade journal. The UN says it's not going to leave Afghanistan because of this attack, but, it also sounds like it's having second thoughts about staying. The United Nations will review all its security procedures but also expects a stronger commitment from the Afghan government he said, warning that protecting foreigners working in the country was vital to guaranteeing international support. "Afghanistan is not any more the center of the world, there is Tunisia, there is Libya, there is Egypt, there are other places which require and will require the attention of the international community, and taxpayers' money and of everyone else, energy," de Mistura said. In addition to attention, money, and energy, the international community might want to take a lesson from our Fortress Embassies, as well. Andrew McCarthy at NRO Online documents the policy flexibility of the U.S. Senate's Three Amigos - John McCain, Joseph Lieberman, and Lindsey Graham. They were for arming Qaddafi before they were for killing him. Read his article here. It was only a short time ago, in mid-August 2009, that Senators McCain, Lieberman, and Graham, along with another transnational progressive moderate, Sen. Susan Collins (R., Maine), paid a visit to Qaddafi’s Tripoli compound. If they seem to have amnesia about it now, perhaps that’s because the main item on the agenda was their support for the Obama administration’s offer of military aid to the same thug the senators now want gone yesterday. WikiLeaks strikes again. Those leaked cables are going to do for foreign policy what YouTube did for elective politics. They make it awkward to take radically different positions on the same issue. That Wikileaks cable is here if you dare to view it. But do so only on a non-government computer.